1 Pour the vinegar, salt, sugar and dill into a plastic sealable box. Stir to combine. Drag a vegetable peeler lengthways down the cucumber, to make ribbons. Put the cucumber into the vinegar mixture. Seal and chill for up to 1 day. 2 Spoon the wasabi mayo into individual little pots. Arrange cucumber ribbons and bread on individual starter plates. 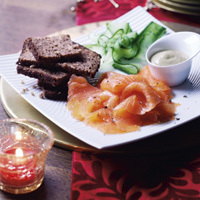 Divide out the smoked salmon, between the plates. Season with ground black pepper and squeeze a hint of lime juice over the fish.